I found this coffee while traveling in Boston and Bar Harbour. The undertones of spices and the smooth coffee blend are great. I buy the single serve for our office in Texas and everyone loves it. I buy the ground for my house, buy double and freeze a bag for a treat in the cold of January! My only regret is the review stars would only let me give it 4 stars instead of 5. It is such a great value and quality! This company as a whole is fantastic, there pumpkin spice coffee is out of this world. Really panicked when my local store didn’t have any Pumpkin Spice coffee this Fall. Then the NEC newsletter showed up in my mailbox. With a discount! Voila! Love it! I drink it all year round. I’ve tried a lot of different brands of Pumpkin flavored coffee and this is by far my favorite! I’ve searched many grocery stores this season and for some reason, there’s a decrease supply of pumpkin flavored coffee this year. I was thrilled when I discovered that New England offered this flavor and was pleasantly surprised by how delicious it was. 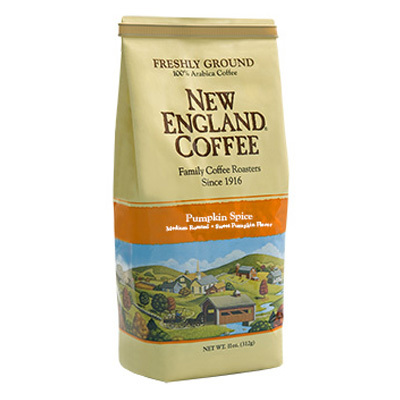 This is now my go to brand for Pumpkin flavored coffee. Thank you for offering this delicious coffee!